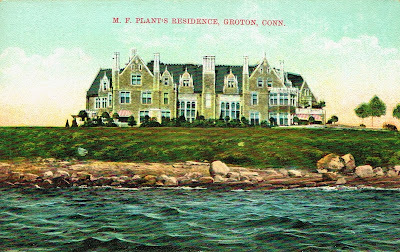 Morton Freeman Plant residence at Groton, Connecticut. Many years ago, I started collecting postcards of Gilded Age Mansions. I often wondered how did so many photographers gain access to these once private domains on vast acreage. Photography was not as easy as it is today, plus one couldn't publish those images taken on the properties without the owner’s permission. As I collected them, I would read the messages on the backs, and many came from the homes depicted on the front. When invited as a guest at a Gilded Age Mansion, often a postcard of the house and stationary with the estates name would be provided. Also just as many beautiful homes today are featured in design and home magazines, in the Gilded Age, many estate owners were flattered to have a postcard of their home for sale at the local drugstore or candy shop. Postcards were the original Tweet, a quick way to say that a person got someplace ok, when they were leaving for home or to just say what a wonderful weekend we are having here at the Vanderbilts! Wish you were here. Here is a store on eBay, GILDED MANSIONS that is selling some cards from my collection. As I digitize them to share on my blogs and Facebook group, I am happy to let them go to others who I hope will discover the same wonder and amazement that I had as a child and still do for this magnificent period of architectural history and lifestyle called the, “Gilded Age”. Click HERE to read about the Plant Residence. If you enjoy the history of the Gilded Age, especially the many architectural residential marvels that were built, please ask to join my group on Facebook called, Mansions of the Gilded Age. In the September 2013 issue of Architectural Digest, page 42. Under the column AD HEARS, " Mansions of the Gilded Age is one of the liveliest design groups on Facebook, with members celebrating (and denigrating lavish examples of late-19th century and early-20th century domestic architecture". The group has over 4000 members and growing. You can participate, by adding photos, links or comments, or just enjoy it and read the postings of the members. It is also a wonderful venue to ask questions about historic mansions, estates or social life of the Gilded Age.